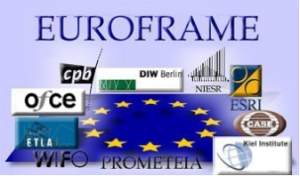 The EUROFRAME group of research institutes (CASE, CPB, DIW, ESRI, ETLA, IfW, NIESR, OFCE, PROMETEIA, WIFO) will hold its fifteenth annual Conference on Economic Policy Issues in the European Union in Milan on Friday 8 June 2018. The aim of the conference is to provide an economic forum for debate on economic policy issues relevant in the European context. The Conference will focus on two main challenges for economic policies: (i) monetary policy normalisation and (ii) political economy of fiscal policies. (i) Central banks are getting out of unconventional monetary policies. Can we expect a return to significantly positive real interest rates? Or is the low interest rate environment likely to prevail, in any case? What are the risks for asset markets and what is the sensitivity of the real economy (at macro and micro levels, for households and firms)? What about central banks’ assets? Did the crisis and financial innovations change the usefulness of concepts like money base multiplier and demand for money? What about central bank independence? (ii) After the Great Recession, different social groups and political parties are trying to reshape public finance and welfare systems. What would the optimal policy mix be in the years to come? What about fiscal versus monetary dominance? Is public debt sustainability under question, in the context of forthcoming monetary policy normalisation? Contributions both on theoretical and empirical grounds of the influences of politics on policies and their economic implications in the long run are welcome. Extended abstracts (2 pages) should be submitted by e-mail until 15 February 2018 to euroframe.conference@ofce.sciences-po.fr. Abstracts should contain: paper’s title, authors’ names and affiliations, and contact details of the corresponding author.